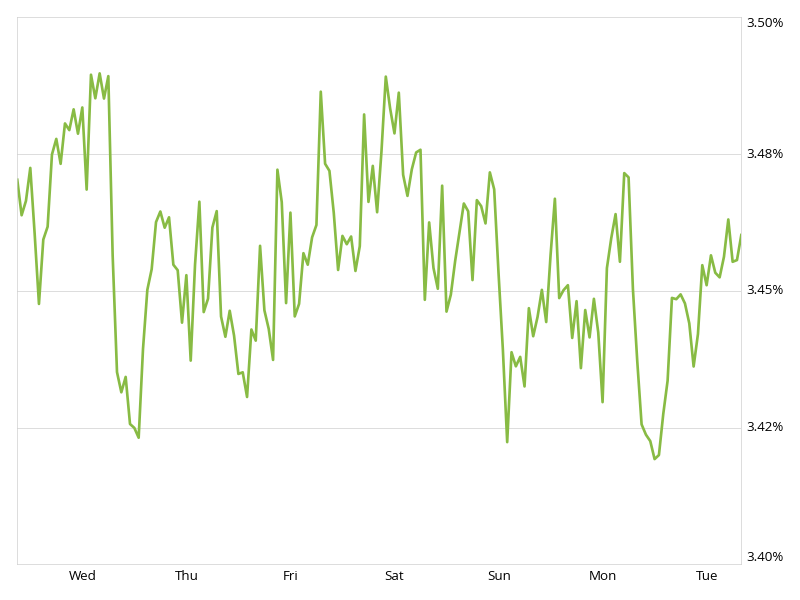 Current mortgage rates for 30-year fixed mortgages rose this week, with the current rate borrowers were quoted on Zillow at 3.46 percent, down 1 basis point from last week. The 30-year fixed mortgage rate hovered around 3.45 percent throughout the week before rising to the current rate. "Last week, mortgage rates remained mostly flat in response to a relatively sedate week," said Erin Lantz, vice president of mortgages at Zillow. "All eyes this week will be on Friday's monthly jobs report. Forecasters are expecting a moderately strong report and disappointing data could push rates lower." Additionally, the 15-year fixed mortgage rate was 2.68 percent, and for 5/1 ARMs, the rate was 2.79 percent. *The weekly mortgage rate chart illustrates the average 30-year fixed interest rate in six-hour intervals.